1.While making chips both banana and potato add little rasam powder and salt to the sliced vegetables and fry.It will have a different taste. 2.While converting whole grain wheat into wheat flour add a teaspoon of fenugreek to it.Chappathis made out of this flour will be soft. 4. While preparing Sundal add a paste of ginger with curry leaves. 5.While preparing oothaappam make a small hole in the centre and pour a tsp.oil it will be crispier. 6.While preparing kesari while adding water reduce the quantity of water instead add coconut milk or boiled milk.Taste will be different. 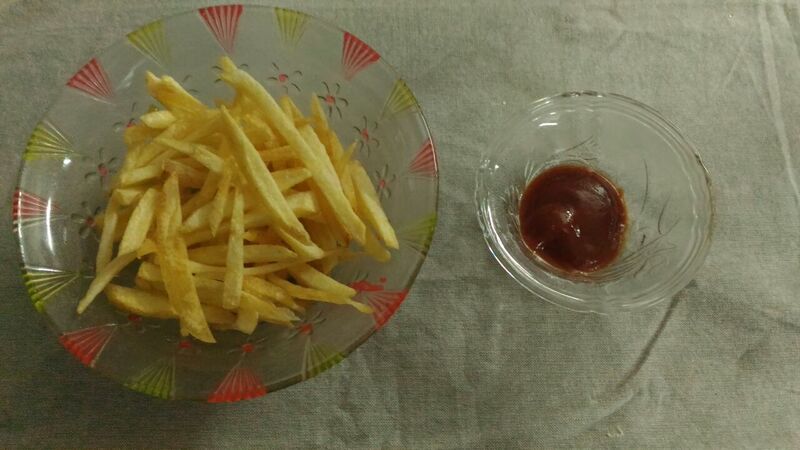 French fries are all time favourite for many.It can be an evening snack or a starter.It will be crispy outside and soft inside.Use large and thick potatoes. 1.First cut the potatoes in the same size after peeling the skin.Some add lime juice or vinegar to the water and soak the potatoes.This will help to remove the starch. 2.In a pan add water and salt when water starts boiling put the potatoes into it for few minutes.Drain the water completely and spread it in a kitchen towel or tissue paper. 3.Heat oil it should be only medium hot and fry the potatoes for few minutes may be for 2 or 3 mts.Remove excess oil and allow it to cool.Then keep in zip lock cover and freeze it. Take them from fridge after 2 or 3 hrs. 4.Then fry again in oil with higher temperature till it becomes crisper and turns golden brown. Then add the chilly powder to it mix well. Optional some use pepper powder instead of chilly powder. Mochai/Field beans are highly nutritious.Some use it as fresh green ones and some use it as dry ones.They are highly nutritious in nature and provide protection against various ailments and diseases.Rich source of manganese,calcium and magnesium.They help in strengthening of bones.It is very healthy one. If the beans are fresh can boil it and then add it.But if it is dried ones then soak it overnight.Pressure cook it for 2 or 3 whistles and then use it for the curry. Instead of chilli powder and coriander can use Sambhar too.this will taste differently. Can use 1 to 2 tbs.coconut scrapings grind and can add. 1.In a kadai put oil. 4.Now add chilli powder,turmeric powder, salt and coriander powder. 6. If going to add coconut add it now. 7.when done add chopped coriander leaves. I thought of posting a sweet recipe for two reasons.One this is my 100 th post and then for my second anniversary with WordPress. Very happy that two years have passed since I started blogging in this plat form.First and foremost I thank WordPress for its support .Next my family ,my friends and my relatives for their encouragement.And above all my followers who have given their support . Payasam is a common South Indian desert.we prepare even for simple occasions like birthdays too.Among all varieties semiya payasam is the easiest one to prepare. 1. Heat ghee in a pan.Fry raisins and cashews and keep aside. 2In the remaining ghee fry vermicelli if the semiya is not fried. 3.After frying a little add boiled milk and allow it to cook. 5.when it blends well and powdered cardamom and fried cashews and raisins to it. It may get thickened after sometime so add milk before serving. This can be served both hot or chill.